There is a growing interest in the use of nanoparticles modified with DNAs, viruses, peptides and proteins for the rational design of nanostructured functional materials and their use in biosensor applications. The challenge is to control the organization of biomolecules on nanoparticles while retaining their biological activity as potential chemical and gene therapeutics. These noble metal nanoparticles/biomolecules conjugates have specific properties and therefore they are attractive materials for nanotechnology in biochemistry and medicine. In this book, the author review work performed dealing with the DNA structure and functionalities, interactions between DNA, noble metal nanoparticles, surface active agents, solvents and other additives. Particular attention is given to how the DNA’s chain length and the DNA conformation affect the interaction and structure of the nanoconjugates and nanostructures that are formed. Also discussed are the recent advances in the preparation, characterization, and applications of noble metal nanoparticles that are conjugated with DNA aptamers and oligomers. The advantages and disadvantages of functionalized nanoparticles through various detection modes are highlighted, including colorimetry, fluorescence, electrochemistry, SPR, and, mass spectrometry for the detection of small molecules and biomolecules. The functionalized noble metal nanoparticles are selective and sensitive for the analytes, showing their great potential in biosensing. 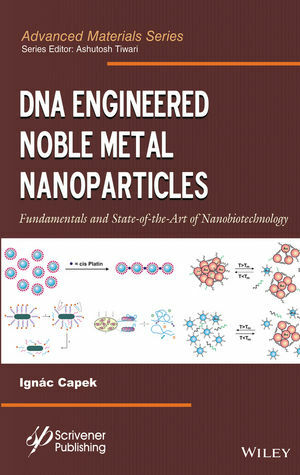 Furthermore, this book reviews recent progress in the area of DNA-noble metal nanoparticles based artificial nanostructures, that is, the preparation, collective properties, and applications of various DNA-based nanostructures are also described. Professor Ivan Capek is author and co-author of 3 scientific books and 20 chapters, 20 review articles,? ca.170 articles? with and 1000 citations and? more? than? 20 ?patents. He is Head of the Department at the Polymer Institute, Slovak Academy of Sciences, Bratislava, Slovakia.